We headed out of Corps at around 10:30am on the N85. Lot’s of traffic and after a short descent we were climbing again. 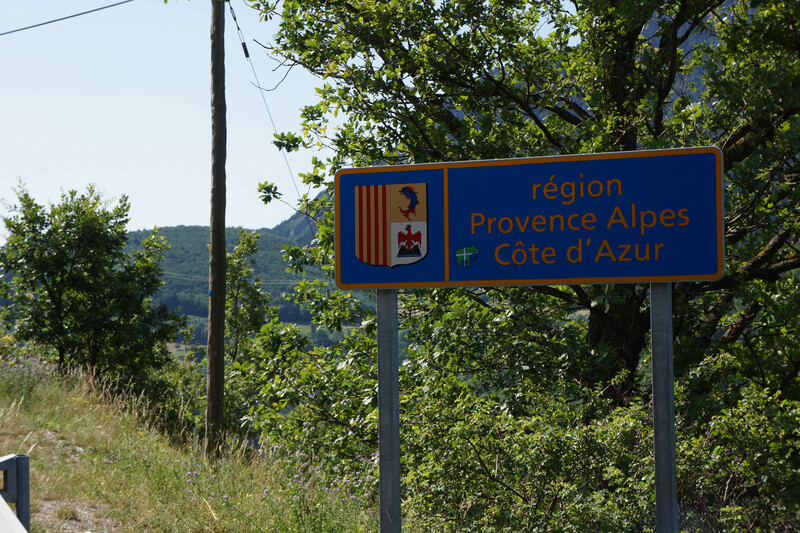 Shortly after Corps we crossed the boundary of Region Provance Cote’d Azur, departament Haute-Alpes (high alps, no s**t!!!!). Still quite a way from Cote’d Azur, but still, made the climbing feel a bit more rewarding 🙂 We were heading towards Col Bayard or Col de Mense. I was going to ask locals about which of the two is more cycle friendly. Shortly after the sign, we turned right onto a side road running parallel to the N85 through L’Gaizile (D57L). Beautiful road running along the Drac torrent. Climbing very gently towards L’Gaizile to around 950 meters and than descending sharply back towards N85. Back on the N85 started to look for a pique-nique spot, raced with a Belgian caravan towards an empty table (we won). We ended up having lunch together at the same table. 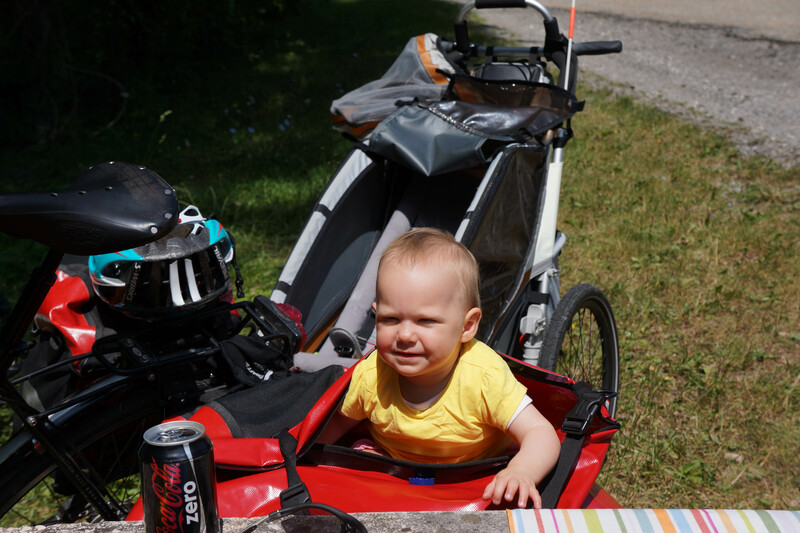 Dianna sat in the Ortlieb rack pack and loved it! Locals at the Bar/Tabac advised to go for Col De Mense and they were right. 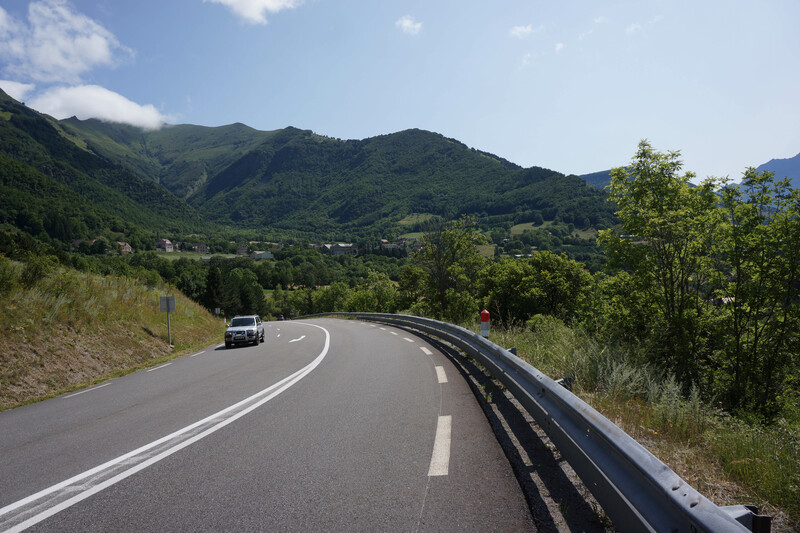 The road towards the Col (D14) was quiet and not to badly inclined (Col Bayard promised 12%). It was still a slog, up to 9% for around 4km. Finally arrived at Col at around 4pm and stopped at the nearby Refuge Napoleon for drinks. There I realized that it doesn’t make sense to do a sharp descent into Gap when we could do a gradual descent into Chorges – the town we are going tomorrow, and shave of 20km of the busy N94. Brilliant idea it turned out to be, N94 is horrible. The route was 17km longer than expected, however, at least 13km were downhill.